Future Market Insights (FMI) delivers key insights on the wood pellet market in its latest report titled, 'Wood Pellet Market: Global Industry Analysis and Opportunity Assessment, 2017–2027'.According to the report, the global wood pellet market is projected to expand at a healthy CAGR of 8.6% during the forecast period in terms of revenue. Wood pellet can be defined as biofuel made from compressed organic matter or biomass. Wood pellets can be burned with high combustion efficiency. Wood pellets are usually made from clean conifer sawdust and planer shavings. The wood must have been debarked prior to passing through the sawmill. Dry sawdust and shavings (less than 15% moisture content) are used, because then, the drying step can be skipped. Sometimes, a small amount of wood chips are added during the drying process to increase the amount of feedstock; this is then pulverised in the hammer mill. Alternatively, where the production of wood pellets directly from round wood is envisaged, this will require additional debarking and chipping steps in the process, which can significantly add to the cost. There are basically three types of wood pellet: made out of forest and wood waste, agricultural residue, and others. Due to wood pellets being cost-effective and energy-efficient, they have managed to gain acceptance. Globally, residential, commercial, as well as animal breeders utilize wood pellets to follow efficient-energy practices. The global wood pellet industry has witnessed major expansion of global key players, with diverse product portfolios. The wood pellet market is highly competitive, with players focusing on a diverse range of offerings based across different features and cost differentiations. Competitors, with an objective to gain high market share and increase their geographical presence, focus on constant innovation, leaning their distribution chain and improving the penetration of their products by tying up with various industries. Also, companies need to strategically align their offering portfolio considering the end use and application. The global wood pellet market has been estimated to be valued at US$ 9,204.9 Mn by 2017 end, and is expected to expand at an 8.7% CAGR over the forecast period of 2017 to 2027. Amongst all the regions, Western Europe is anticipated to account for a significant value share in the global wood pellet market by 2017 end, followed by North America with a 7.8% value share. Western Europe is anticipated to exhibit a higher incremental value during the forecast period as compared to other regions. Asia Pacific excluding Japan is projected to register a CAGR of 9.9% over the forecast period, to account for an 8.7% value share by 2027 end. The Middle East and Africa is expected to account for a 0.7% value share in the global wood pellet market by 2017 end. The market in MEA is expected to register a CAGR of 7.4% over the forecast period. The Chinese wood pellet market has been estimated to be the most undetermined for the wood pellet industry, both, in terms of domestic production of wood pellets and their potential demand. China has a very limited forest resource, but has almost unlimited agricultural waste, which can be utilized for the production of wood pellets. However, producing wood pellets through agri-waste has many challenges associated with it. The 2016-2020 five-year plan in China has many policies supporting the industry. Even at moderate ratios, if China were to embrace wood pellet co-firing, the demand will be significant. FMI analysed that, if 12-16% of China’s coal power plants are co-firing (at a 5% co-firing rate, in 2020), an annual demand of approximately 40 million tonnes will be generated. Wood pellets are manufactured from renewable forest by-products, sawdust, and agriculture waste materials. Wood pellets are fast becoming popular in North America, owing to the increasing prices of primary fuel. The demand for wood pellets in North America as a bio-mass fuel is increasing significantly, attributed to the high demand for industrial as well as commercial purposes. Rising prices of fossil fuels, including natural gas and fuel oil, is one of the major driving factors for wood pellet heating. Concerns about climate change in North America are also stimulating the growth of the wood pellet market in the region. Increasing carbon emissions is a major driving force for the wood pellet market in the Western European region. There is high demand for wood pellets in this region to reduce carbon emissions and raise the contribution of total renewable energy consumption. The use of co-firing and dedicated biomass power plants is a part of the compliance plan, which helps drive the wood pellet market in this region. Government certification is a valuable tool to assure customers that the wood pellets are made from sustainably managed forests. Increasing certification criteria is a key restraining factor in the North American wood pellet market while exporting to other countries, where various rules mandate renewable energy production. The wood pellet procurement policy is also one of the key restraining factors of the North American wood pellet market. For instance, norms laid down by the Sustainable Forestry Initiative and Forest Stewardship Council (certification organisations of North America) restrict the growth of the wood pellet market in North America. Approximately 19% of U.S. commercial forestland is certified by major U.S. standards. According to the Wood Pellet Association of Canada, approximately 9% of world forests are certified. Out of these, more than 40% forests are in Canada, which makes these forests an ideal source of wood pellets. Western Europe is one of the largest regional wood pellet markets based on consumption, and production is less than consumption in this region. Efforts are being made to increase the production capacity of wood pellets in this region. Swedish softwood lumber supply is estimated to increase over the forecast period, which will help increase the production capacity of wood pellets. The production capacity of wood pellets in Chile is growing rapidly, owing to low manufacturing costs. Brazil as well as Argentina are two of the largest producers of wood pellets made of industrial round wood and sawdust. The rapid rate of production of wood pellets across the Latin American region is one of the major driving factors of the global wood pellet market. Large amounts of wood pellets are being used to produce electricity in this region. For instance, annually Chile alone produces approximately 16 Mn cubic meters of firewood and more than 40 Mn cubic meters of industrial round wood. On the basis of feedstock type, the market is categorised into forest & wood waste, agricultural residue, and others. Globally, the forest & wood waste segment is estimated to account for a prominent market share of 56.1% by 2017 end. Agriculture residue & waste is efficient, and due to this, the segment’s market share is expected to gain 193 basis points over the forecast period. Based on application, the market has been segmented into free-standing stoves, pellet stove inserts, and pellet boilers. With energy and climate change, the pellet boilers segment is expected to expand at a decent CAGR of 9.9% over the forecast period. Based on end use, the market has been segmented into industrial pellets for CHP, industrial pellets for co-firing. Globally, large corporates import wood pellets as per the requirements. With the growing use of industrial pellets for CHP, this end use segment is expected to expand at a decent CAGR of 10.3% over the forecast period. In this report, the global wood pellet market has been segmented into seven major regions, namely, North America, Latin America, Eastern Europe, Western Europe, Asia Pacific Excluding Japan (APEJ), Japan, and the Middle East & Africa (MEA). Globally, in terms of revenue, the Asia Pacific Exc. Japan wood pellet market is estimated to account for US$ 713 by 2017 end, and is projected to expand at a CAGR of 9.9% over the forecast period. This can be attributed to the growing demand for wood pellets, rapid growth of exports in the region, and a wide presence of companies like Pinnacle Renewable Energy, which is also enabling the expanding the reach of wood pellets. The Middle East and Africa wood pellet market is expected to increase 2.03X between 2017 and 2027. Detailed profiles of the providers are also included in the scope of the report to evaluate their long-term and short-term strategies, key offerings, and recent developments in the global wood pellet market space. The global wood pellet market is highly fragmented. Based on their revenue bracket, tier-1 and tier-2 players constitute 12-15% of the total wood pellet market. Tier-1 prominent players include Drax Biomass Inc., Rentech Inc, Enviva Partners LP, German Pellets GmbH, Vividis Energy Inc, AS Graanul Invest, Pinnacle Renewable Energy Inc, Lignetics Of Idaho, Inc, Zilkha Biomass Energy, LLC, and Land Energy Girvan Limited. Tier-2 prominent players include Colombo Energy Inc, Premium Pellet Ltd, Agon Biomass, Pellet Power, Blue Sky Biomass, Bio Eneco Sdn Bhd, Schellinger & Co Mühlenwerke, Fram Renewable Fuels, and Snow Timber Pellets LLC. In this report, historical data, primary responses, and public domain data has been thoroughly analysed to infer the market size. Revenue of companies operating in the wood pellet market has been benchmarked to ascertain the market size for the base year. Macroeconomic indicators such as GDP and industry growth have been considered to forecast the market size over the forecast period. The historical growth trend of end-use industries, market participants’ performance, as well as the present macro-economic outlook have been taken into consideration for estimating the overall market trend forecast. This data is then validated using the triangulation method, and is extensively scrutinized using advanced tools to garner quantitative and qualitative insights into the global wood pellet market. Future Market Insights (FMI) delivers key insights on the global wood pellet market in its published report, titled 'Global Wood Pellet Market: Global Industry Analysis (2012-2016) and Opportunity Assessment (2017–2027)'. In terms of value, the global wood pellet market is estimated to expand at a CAGR of 8.7% over the forecast period, owing to numerous factors, about which, FMI offers thorough insights and forecasts in this report. The primary objective of the report is to offer updates on market opportunities in the global wood pellet market. The report starts with an overview of the global wood pellet market. This section also includes FMI’s wood pellet market analysis regarding key trends, drivers, and restraints from a supply and demand perspective. The impact analysis of key growth drivers and restraints based on the weighted average model are included in the wood pellet market report to better equip and arm clients with crystal-clear, decision-making insights. Various factors impacting the demand for wood pellet market have been analysed in this report, such as increase in forest product consumption, increase in consumption of industrial wood products, the use of forests for commercial purposes, share of fuel wood in total wood production and harvesting, pellet capacity growth, increase in the demand for woody biomass, etc. The pricing analysis section includes the variation in prices of wood pellet on a per ton basis. In Western Europe, the prices of wood pellet are high due to their high demand, along with low availability of feedstock in the region. So, the price of wood pellet per ton is higher as compared to other regions. In North America, the price is moderate due to high production in the region, and also feedstock prices being low due to high availability. In the APEJ region, the price is moderate due to the high availability of feedstock in countries such as Malaysia, Vietnam, and Thailand. To calculate the wood pellet market size, the report considers the average selling price of various types of systems across geographies. Furthermore, data points such as regional split and market split, by feedstock type, application, and end use type, and qualitative inputs from primary respondents have been incorporated to arrive at the apt market estimates. The forecast presented here assesses the total revenue that is expected to be generated across the wood pellet market over 2017–2027. When developing the market forecast, the starting point involves sizing up the current market, which forms the basis on how the market is anticipated to take shape in the near future. Given the characteristics of the market, we triangulated the outcome on the basis of various analysis results based on both, the supply side and demand side. However, quantifying the market across the aforementioned segments and regions is more a matter of quantifying expectations and identifying opportunities rather than rationalizing them after the forecast has been completed. It is imperative to note that, in an ever-fluctuating global economy, we not only conduct forecasts in terms of CAGR, but also analyse the market on the basis of key parameters, such as Year-on-Year (Y-o-Y) growth, to understand the predictability of the market and to identify the right opportunities in the wood pellet market. All these sub-segments or categories of wood pellet market have been analysed in terms of Basis Point Share (BPS) to understand the individual segments’ relative contribution to market growth. This detailed level of information is important for the identification of many key trends in the wood pellet market. Another key feature is the analysis of the wood pellet market by region, by feedstock type, application, and end use type, and its revenue forecast in terms of absolute dollar opportunity. This is traditionally overlooked while forecasting the market. However, absolute dollar opportunity is critical in assessing the level of opportunity that a provider can look to achieve, as well as to identify potential resources from a sales perspective in the global wood pellet market. In order to understand key growth segments in terms of growth and performance of the wood pellet market, Future Market Insights developed a market attractiveness index. The resulting index should help providers identify real market opportunities. 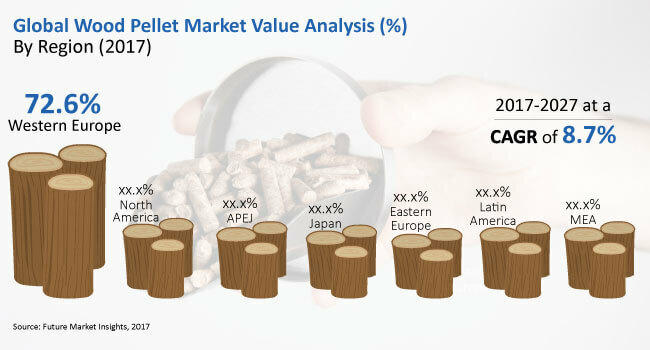 In the final section of the report, the wood pellet market landscape is included to provide report audiences with a dashboard view of the market players, based on categories of providers across the value chain, their presence in the wood pellet market portfolio, and key differentiators. Wood pellet industry structure and company market share analysis has been analysed in this report. Here is an attempt to assess the market share of various companies pertaining to the wood pellet market. Market share is estimated on the basis of the sales of wood pellet across the globe. Various sources referred include company annual reports, investor presentations, analyst presentations, and company press releases. The outcome has been triangulated with distributors, retailers, and industry experts across the value chain. Some of the major market players featured in this section are Drax Biomas Inc, Rentech, Inc, Enviva Partners, LP, German Pellets GmbH, Viridis Energy Inc, AS Graanul Invest, Pinnacle Renewable Energy Inc, Lignetics of Idaho, Inc, Zilkha Biomass Energy, LLC, and Energy Girvan Limited.